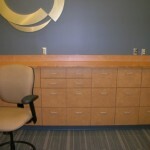 PPL Gold Credit Union - Work Performed by K&L Woodworking, Inc.
PPL Gold Credit Union is a chain located in Allentown, PA. 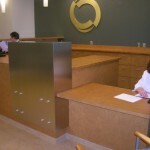 In this particular branch, K&L Woodworking was contracted to produce Plastic Laminate and Metal Laminate casework to match an existing branch. 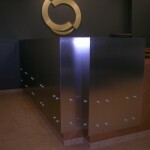 The work produced includes a Reception Desk with Formica DecoMetal Accents and Aluminium Stand-Offs. 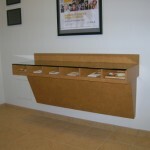 Rear Teller Cabinets and Custom Check Station utilize Formica Camel Leather Plastic Laminate Tops with Pionite Graveyard of the Atlantic bases and supports. Not pictured is a Customer Lunch Room which also Utilizes the plastic laminate color scheme listed above. The final piece of this project is a PPL Gold Credit Union logo which was CNC Machined and wrapped in Pionite Brushed Gold and secured to the wall behind the Teller Station. 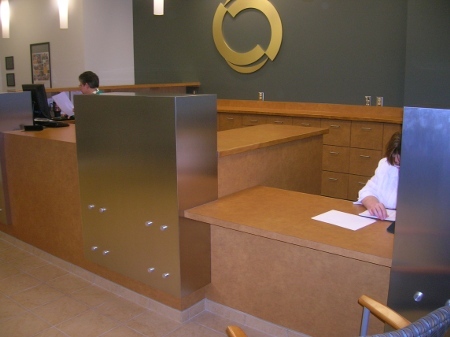 Casework is constructed from 3/4″ White MCP with Plastic Laminate doors, drawer fronts, and finished sides. Drawers utilize the Grass Zargen System and doors utilize Nexus Concealed Hinges by Grass. Established in 1973, K&L Woodworking, Inc. has been providing custom architectural millwork for the east coast for over 30 years. Specializing in custom architectural millwork for Commercial and High-End Residential customers.